Few regions rival the magnificence of California's Monterey Peninsula. This beauty, together with a mild climate, rich history, and simplicity of lifestyle, encouraged the development of one of the nation’s foremost art colonies. From 1875 to the first years of the twentieth century, artists were drawn to the towns of Monterey, Pacific Grove, and then Carmel. 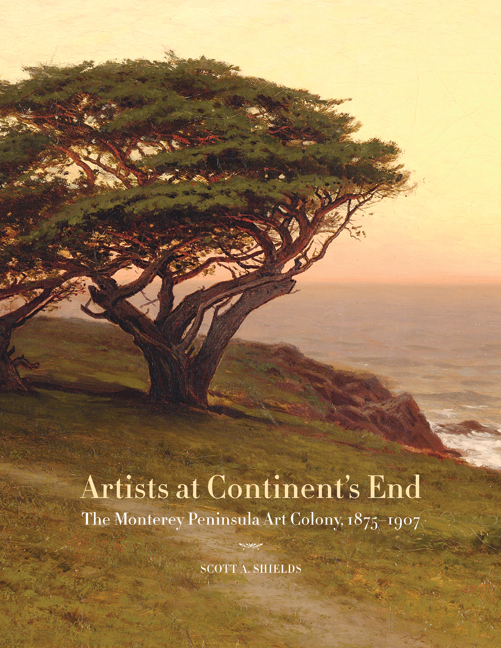 Artists at Continent's End is the first in-depth examination of the importance of the Monterey Peninsula, which during this period came to epitomize California art. Beautifully illustrated with a wealth of images, including many never before published, this book tells the fascinating story of eight principal protagonists—Jules Tavernier, William Keith, Charles Rollo Peters, Arthur Mathews, Evelyn McCormick, Francis McComas, Gottardo Piazzoni, and photographer Arnold Genthe—and a host of secondary players who together established an enduring artistic legacy. Most previous accounts claim that the 1906 San Francisco earthquake and fire were the reason that artists began to gather on the Monterey Peninsula. Shields challenges this view by demonstrating that the colony began much earlier—and in Monterey, not Carmel, as often asserted. In an absorbing narrative that combines art and social history, Shields describes how, beginning with Jules Tavernier's arrival in 1875, art produced on the peninsula broke from its East and West Coast antecedents to become increasingly subjective, meditative, and simple. He maintains that, by the turn of the century, the majority of the artists in the region had arrived at a tonal style featuring moody atmospheric effects. Some went one step farther, producing canvases reductive in color and form; others practiced a more colorful impressionism. Created to accompany a major traveling exhibition of works of the Monterey Peninsula Art Colony, Artists at Continent's End places the movement in its art-historical context, comparing its achievement with other approaches including the Barbizon style, art nouveau, arts-and-crafts, and impressionism. Scott A. Shields is Chief Curator at the Crocker Art Museum in Sacramento, California.